The Competec Group relies on its employees, since they are the foundation of shared success. We are constantly looking for experienced professionals in various areas of expertise who can help us shape the future of our company. 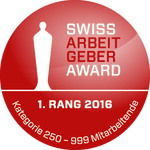 An exciting business environment and great fringe benefits make the Competec Group an attractive employer – we even won the «Swiss Employer Award» in 2016. People are at the centre of our activity. In addition to our customers and numerous partners, our employees are our top priority. · We value well-informed employees who act under the greatest possible personal responsibility. · We pursue ambitious goals, which we achieve through mutual trust and teamwork. · We promote networking and a sense of belonging among our employees – after all, we spend a large part of the day with our colleagues. · Above all, we demand trustworthiness, reliability, collaboration, commitment and teamwork. · We ensure a friendly and fair interaction between the teams and individual employees, because we believe this is the only way to solve challenging tasks together. Employees of the Competec Group enjoy attractive fringe benefits such as discounted prices on products from the entire Competec range, daily fresh fruit and mineral water free of charge, a discount for a subscription at the Impuls fitness centre as well as in the canteens of Mägenwil and Willisau. Healthy and happy employees shape the company and determine its vitality. That is why we encourage our employees to stay active. This includes internal courses such as self-defence, cooking or stress management as well as external events (Wings for Life) or coaching within the company by trained specialists. Please apply online – this is the easiest and fastest path to success for both sides. Upload your documents such as your CV and cover letter in standard formats. No matching job offer? Send us your spontaneous application or subscribe to our job alert. We thank you for your interest in working for the Competec Group. Further information can be found in our flyer: Company Profile Information.